Born in the Wild is a new reality show that we aren't too sure about. Is this the worst idea for a reality show in the history of TV? That may be a big call (we’ve all seen Dance Moms). But once you see what this reality show is about, you will 100% agree. Giving birth. While Hallmark thinks it’s a magical moment filled with rosy cheeks, pink or blue ribbon and smiling parents, this is not reality. Reality is way messier, involves purple babies, blood, and pain (and, of course, ends in a beautiful baby). So why wouldn’t you make a reality show about giving birth? Everyone loves One Born Every Minute, right? Why wouldn’t you make a reality show about women giving birth in the wild? And by wild, I don’t mean dressed up TV set with a few palm trees and wind from a fan. By wild, we mean Survivor wild. A still from Birth in Nature by Simone. 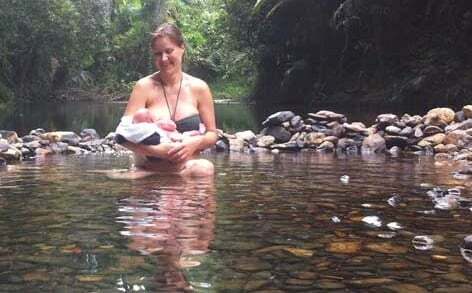 The show was inspired by Simone, a woman who was filmed giving birth completely unassisted in the Daintree Rainforest (north-eastern Queensland) and uploaded it to YouTube in February. To date, it has received 20,469,213 views. The new reality show, Born in the Wild, announced by Lifetime on Wednesday, will following young parents who will ditch the hospital for nature to give birth. Why? Because giving birth surrounded by the beauty and serenity of nature is beautiful. What happens when the craziest experience of a woman’s life becomes truly wild, and soon-to-be parents decide to take on an unassisted birth in the outdoors? Critics of the show have warned Born in the Wild could kick off a dangerous trend that will endanger mothers and their babies. Lifetime has stated that the reality show participants may not always be first time parents and will be monitored closely by the crew. "We’re taking extreme precautions to make sure the mothers and the babies are safe," Eli Lehrer, Lifetime’s senior VP and head of nonfiction programming, told Entertainment Weekly. "Our presence at these births is going to make them far safer than if they were doing it on their own." However, the dangers of an unassisted birth in nature are too clear to ignore. Besides the normal dangers of giving birth unassisted and the distance to hospital facilities if things go wrong, there is also the wildlife to consider. There are crocodiles in the Daintree, people. Not the delivery room audience you want while giving birth. WARNING: The below video is a GRAPHIC account of a "wild birth". How and why I chose to give birth in nature was much about the inner journey as the outward process ... and equally as powerful. Afterwards I felt like my whole life had been in preparation for that one moment. My sense of wholeness and peace was bigger and deeper than anything I had ever felt before. This feeling only continues to expand and ripple out into my family, my relationships, my life. It has had a profound effect on my mothering and for my children especially. For the full video, watch below. Apparently, we’re not all “mum enough” for a natural birth.